Get ready to cross “Waterjet Boat Ride” off your bucket list! 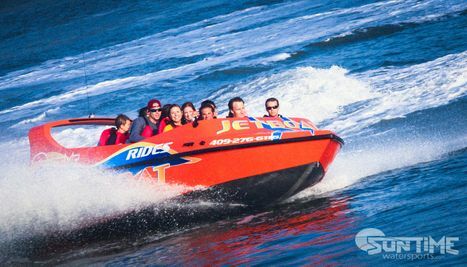 Suntime Watersports is now offering Jet Boat Thrill Rides at Pier 21. Adventure seekers, ages 4 to 104, will enjoy this new and exciting boating experience. 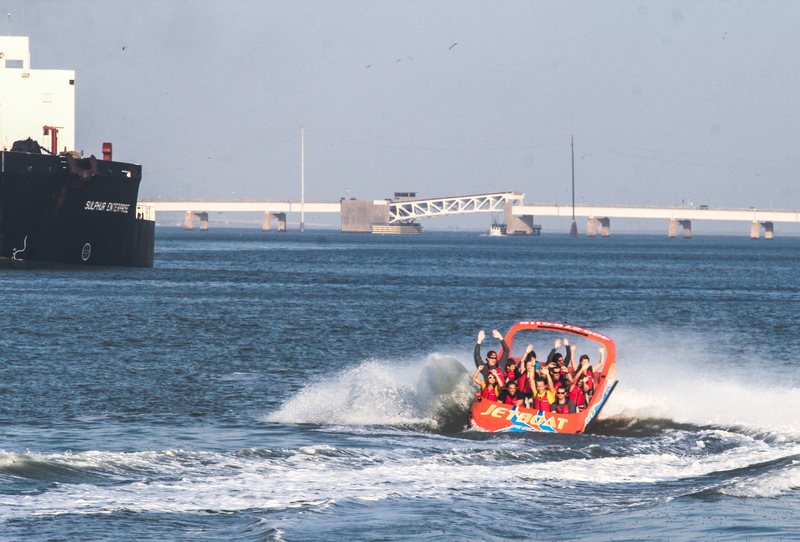 The Jet Boat Thrill Ride provides an exhilarating adventure in the Texas sun and the chance to experience the “Hamilton Spin,” a maneuver that rotates the boat 360° on its axis while throwing a wall of water into the air. Riders will also experience the thrill of sharp right angle turns and accelerated speeds that will result in the boat ride of a lifetime. The jet boat is eco-friendly and operates on a low-emission fuel system that is highly efficient and features an unexposed propeller system to protect marine life. To ensure the safety of riders, the Suntime Jet Boat is operated by master captains licensed through the U.S. Coast Guard. The 11-passenger HamiltonJet Waterjet boat used by SuntimeWatersports is stocked with one of the most advanced and innovative marine propulsion systems in use today, an LS3 6.2 liter engine which is also used in such American muscle cars as the Chevrolet Camaro SS and Corvette. Built with New Zealand engineering, its precise steering capabilities provide an exciting 360° thrusting ability and a smooth, quiet ride to create an experience of a lifetime. In addition to the Jet Boat Thrill Rides, Suntime Watersports also plans to offer a water taxi service for those traveling between Seawolf Park on Pelican Island and Pier 21 at downtown Galveston. “It’s perfect for those looking to tour some of Galveston’s hot spots in style, all while avoiding the unnecessary stress of traffic and parking,” adds Forshee. Jet Boat Thrill Rides will operate daily and on holidays from 10 a.m. until the fun stops. Check the Suntime Watersports website and Facebook page for frequent discounts and daily deals. For more information, visit www.suntimewatersports.com or call 409-276-6116. Suntime Watersports is located at Pier 21 Marina which is part of Mitchell Historic Properties. With the addition of Jet Boat Thrill Rides, Pier 21 is now home to seven attractions including the Texas Seaport Museum and 1877 Tall Ship Elissa, the Ocean Star Offshore Oil Rig Museum, BayWatch Dolphin Tours, Galveston Harbor Tours, and Pier 21 Theater which now offers three movies – The Great Storm, The Pirate Island of Jean Laffite and Galveston: Gateway on the Gulf. Pier 21 is home to four restaurants including Nonno Tony’s World Kitchen, which is opening late this summer, and Harbor House Hotel and Marina. Suntime Watersports is owned and operated by Graham Forshee, a graduate of Texas A&M University at Galveston. Following graduation, Forshee worked for several watersport companies in Myrtle Beach, SC and decided to bring this excitement to Galveston. Pier 21 is a waterfront entertainment and dining area located on Galveston’s historic harbor in The Historic Strand Seaport Area. Pier 21 offers restaurants, a variety of attractions such as BayWatch Dolphin Tours, Pier 21 Theater and the Texas Seaport Museum as well as Harbor House Hotel and Marina. Pier 21 is part of Mitchell Historic Properties which is owned by George Mitchell and the Mitchell family. MHP owns and preserves approximately one-fourth of the buildings in The Historic Strand Seaport Area. For leasing information, visit www.MitchellHistoricProperties.com or call (409) 763-5806. The Jet Boat Thrill Ride at Pier 21 provides an exhilarating adventure in the Texas sun and the chance to experience the “Hamilton Spin,” a maneuver that rotates the boat 360° on its axis while throwing a wall of water into the air.